Hey everyone, belated happy new year for 2017! I’m back to work after taking a few weeks off. Now things have settled down, I’m also back to working on Daggerfall Unity’s quest system. You can expect a blog post for part 3 of this series soon. Quests are the beating heart of Daggerfall, everything from the tutorial to vengeance! are powered by quests, and this will be my main focus in 2017 until things are working well enough to move onto spells and effects. With a bit of help from others this will come together at a reasonable speed. Just to manage expectations, you won’t see a fully-formed quest system arise out of nothing – things will continue to be built in small stages. But barring any major setbacks, you should be able to launch quests for testing with the quest debugger by March-ish. I can’t promise every part of quests will operate (in fact, I guarantee it won’t) but it should be enough for testers to sink their teeth into and iterative development will continue from there. Speaking of help, I’m also looking forward to seeing what contributors and modders do in 2017. I think last quarter saw the most number of new contributors since Daggerfall Unity began in August 2015. This is really exciting for me because it confirms opening source from the beginning was the right choice. There will probably come a point where the project will be taken further by others (and probably faster) than I could take it by myself. If things keep heading the way they did in 2016, this should be a big year for Daggerfall Unity. Hello everyone! This will be my last post for 2016. It’s been a great year for Daggerfall Unity with solid updates across the board. I was hoping to have basic quest support in by now, but sadly not everything goes to plan. This will return as a priority early in 2017 so watch this space! One thing that always amazes me is the quality of work this community is willing to put back into Daggerfall Unity. It’s always a pleasure to find a new pull request on git from someone willing to contribute their personal time to make this project even better. So this post is going to focus almost exclusively on contributions from community members. It’s time for kudos and credits all around, and you’ll see very little of me this post. This feature began with Uncanny_Valley and has lately been updated and maintained by TheLacus. It allows for runtime injection of new textures and meshes into Daggerfall Unity’s scene builders, setting the stage for updated models, higher resolution materials, and improvements to Daggerfall’s vanilla UI. It’s still early days but the potential is incredible. Here’s a few screenshots of new assets by community members. At time of writing, mesh and texture replacements aren’t quite ready for download. But now support for this is baked into the core, you should start seeing community-created packs in the near future. You can read more about mesh and texture replacement in this thread on the forums. New contributor electrorobobody added basic bow combat to the lineup of supported weapon animation. No counting arrows yet, and you’ll need to roll a new character for your free silver bow, but it’s awesome to finally burn down enemies with ranged kiting. Looking forward to bows becoming a strong part of the game in future. Daggerfall Unity added basic weather events a while back, but they would not be saved and loaded with your games. Thanks to midopa, the current state of weather will be saved and loaded. This will only get better once correct weather events are wired up based on climate and season. Another epic update by midopa. He added a little steering to enemy AI to prevent enemies from stacking on top of small creatures like rats. As hilarious as this problem could be, it’s good to see a workable solution for this bug. It’s still possible for enemies to slightly stack in edge cases, but the problem is much improved and they will no longer ride around on each other (imagine skeletons surfing rats and rat-rat-rat stacks). The perennial InconsolableCellist returned with some amazing updates for us. 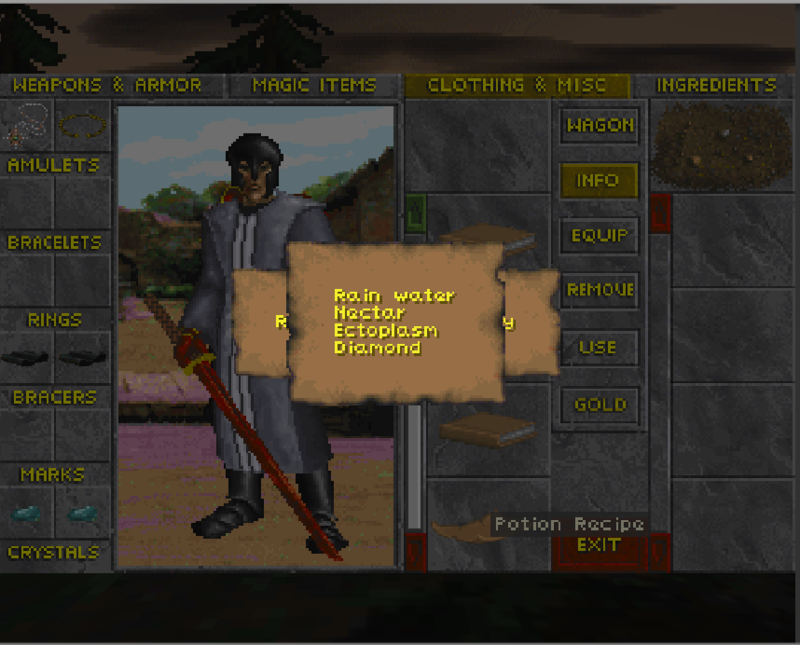 Credit goes completely to him for working out potion recipe format and integrating with Daggerfall Unity. This also means potion recipes will display properly in inventory, and they’re even usable to see the individual ingredients. This is really important ground-work for a bunch of other things down the line. I wrote the initial book reader UI ages ago, but InconsolableCellist wrapped it up along with random book drops in loot, correct tooltips, and all-round awesomeness. Books currently exhibit the same formatting problems as classic (because it’s the same book data). That’s something yet to be fixed. Nystul has done it again with the perfect companion UI to his dungeon and interior automap. Yep, exterior automaps are now a thing! It even supports proper tagging of buildings, zoom, and rotation. As always, I’m completely blown away by how complete this is right from the start. It’s still waiting on full building name integration and building identification in scene, but that will come. For now, all the buildings are tagged by type. Go explore! I can’t give Allofich high enough praise. He has worked incredibly hard tuning up different areas of Daggerfall Unity to make it more true to the original. He fixed a wide range of UI problems, identified sound effects, linked sounds to their correct actions, fixed clothing and item problems, and so on. Check out his full list of commits here. It’s hard to show these off properly in screenshot form because the changes are either subtle improvements or related to audio, but below is one of the UIs he has cleaned up. 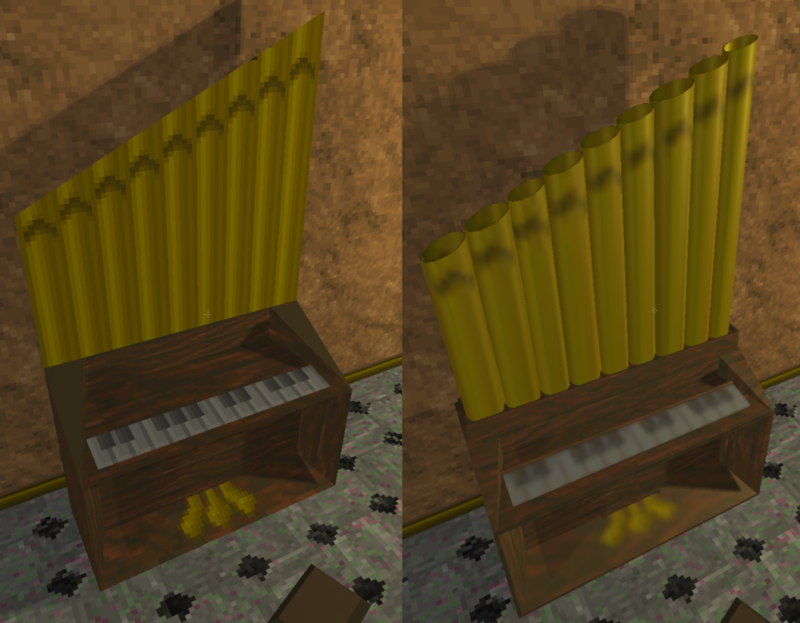 Note the poor texture joins in the “before” image (circled). Huge props to Allofich for his work! It’s only a short jump from here to having these transport options in the game. I also want to send out a huge thanks to all the amazing people who tested Daggerfall Unity in 2016 and reported the bugs and problems you found. There are simply too many people to list, but you know who you are. You’re on the forums, and Twitter, and Reddit, and sending me emails. You guys rock! Yep, we got ’em! Any large update like this will bring its fair share of new bugs. If you come across a bug during tests and would like to report it, please lodge this in the Bug Reports forum. Don’t forget to read the Guidelines to help you provide the best information to developers. Contributors, please keep an eye on the Bug Reports forum for anything that might fall into your wheelhouse. You can always download the latest version of Daggerfall Unity from the Live Builds page. If this is your first time downloading Daggerfall Unity, welcome! Other information on Live Builds page should also help you get started. If you have any troubles, or just want to discuss updates, please go to the December 2016 Test Builds Updated thread on forums. That’s it for 2016! Thank you everyone for visiting and all your kind words of support. Here’s wishing you all a very Merry Christmas and Happy New Year, and all the best for 2017! 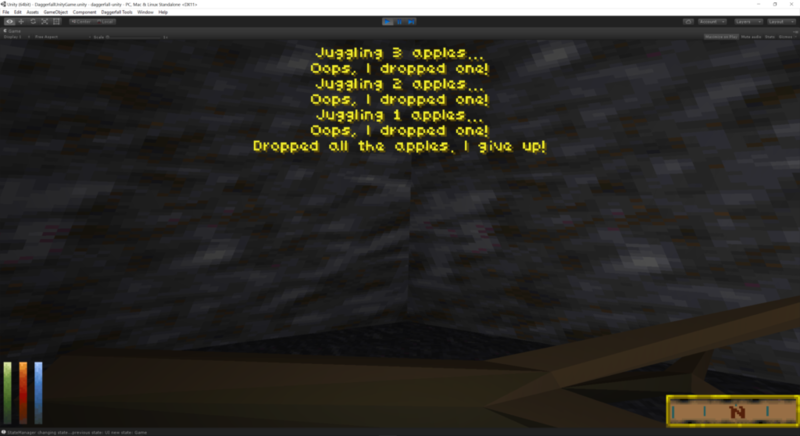 In the first part of this series, I discussed how I’ll be using source files output by Tipton’s Template v1.11 for quests in Daggerfall Unity. If you’d like to check these out in full, the quest source files are already on GitHub. Follow this link to view them (ignore the .meta files). 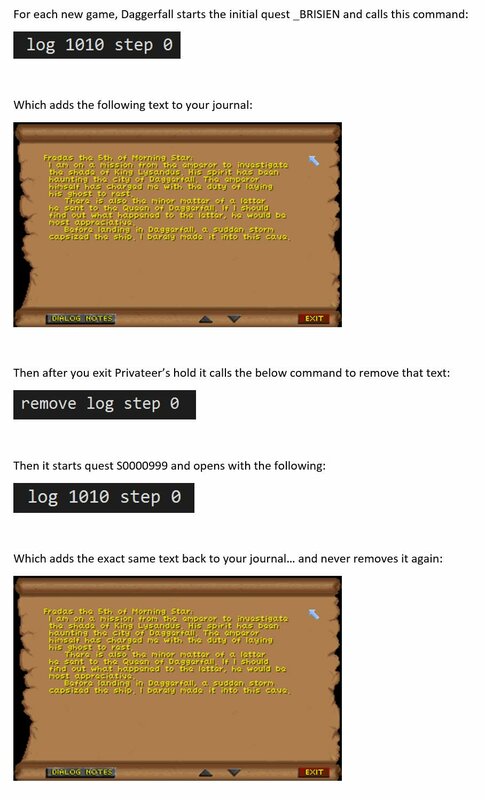 _BRISIEN.txt – This is the quest that launches when player starts in Privateer’s Hold. It sets the whole story arc in motion and starts timers for delivering letters that prompt player to visit Lady Brisienna. Failing to visit Lady B in time is ultimately a failure condition of main quest. S0000999.txt – Starts when you leave Privateer’s Hold. Delivers letters from Prince Lhotun and Morgiah and sets key global variables. S0000977.txt – Also starts when leaving Privateer’s Hold. Sets up regular ghost and wraith spawns in Daggerfall and plays the VENGEANCE! sound. TUTOR.txt – Is the tutorial quest started when selecting Yes to the prompt at start of game. …will stick around in your log forever. Even after you’ve completed the game, this first journal entry will remain. As part of researching the quest system a while back, I looked into why this was happening and found the above journal entry is added twice and removed only once. The below image sums it up visually. You may have already seen this when I posted it to Twitter back in September. So the quest system in Daggerfall is quite powerful. It’s responsible for adding and removing journal text, starting timers, delivering letters, spawning enemies, playing sounds, setting global variables, moving NPCs, and a slew of other functions. At first blush it can appear a lot like a full programming language, but it’s only superficially so. The structure is actually more like a complex INI file, or even a kind of markup file. Everything is neatly categorized into its own section and execution flow generally only happens in a few different ways. Most commonly are at startup, when a timer ends, and due to a variable or condition changing state. Thus despite the initial similarity to a programming language, the quest source is really just a collection of defined objects with some very basic scripting functions. Most of these functions revolve around spawning something, starting something, playing something, or changing something. Complex enough to get the job done, but don’t feel like you need to be a programming expert to create new quests in the future. Using Tipton’s Template v1.11, you could even start creating quests in classic Daggerfall now and later port them into Daggerfall Unity. Likewise, the job of compiling the quest source back into Daggerfall Unity is not that difficult. It’s going to have some challenges, but nothing on the scale of building a real compiler, something I thought I’d be facing at the outset. The problem is largely just splitting source file up into correct parts and handing that source off to classes designed to support that part. For example, messages will go to a Message class, timers will go to a Timer class, etc. When serializing live quests as part of save games, the QuestMachine will save/load JSON state for each live quest along with the global variables for the current game. To help Daggerfall Unity re-compile Template’s source output, I’m going to make some minor changes to the expected source files. I’m trying to keep these changes to an absolute minimum. First change is for the quest header to be uncommented in source file. For example, _BRISIEN has the following header. The dash ‘-‘ prefix starts a comment. This way the information can be parsed back into the quest data at compile time. This makes the startup task an explicit task object to be executed when quest begins. This is already the current behaviour, but I think this change makes the task clearer to identify for both quest creators (even without a comment) and for my compiler. I could definitely get away without this change, but I prefer the explicitness to the current setup. And of course, the above is subject to change as the quest system matures. If I learned anything from rolling out items, the feature will probably look different again by the time it’s mostly complete. Daggerfall Unity is not just a game remake, it’s an ongoing research project into the guts of Daggerfall. That adds a few twists outside of normal gamedev process, and I just need to roll with it. One of the upcoming features not shown yet is the quest debugger currently in development. Hopefully, I will have something to show on this by part 3. The quest debugger will be used to manually start new quests, terminate and restart executing quests, and inspect state of global variables and quest objects. It’s a big UI that will continue to grow as development progresses. Should turn out to be quite useful though.